1.1 Why replace UEFI with coreboot? 1.2 What's wrong with UEFI Secure Boot? 1.3 Why use Linux instead of vboot2? 1.4 What about Trusted GRUB? 1.5 What is the concern with the Intel Management Engine? 1.6 How about the other embedded devices in the system? 1.7 Should we be concerned about the binary blobs? 1.8 Why use ancient Thinkpads instead of modern Macbooks? 1.9 How likely are physical presence attacks vs remote software attacks? 1.11 is it worth doing the hardware modifications? 1.12 Should I validate the TPMTOTP on every boot? 1.14 Disk key in TPM or user passphrase? Heads is an open source firmware, OS configuration and hardware hardening guide for building slightly more secure systems. Installing Heads requires opening the machine and extensive warranty voiding, so this document tries to answer some of the questions about it. Why replace UEFI with coreboot? While Intel's edk2 tree that is the base of UEFI firmware is open source, the firmware that vendors install on their machines is proprietary and closed source. Updates for bugs fixes or security vulnerabilities are at the vendor's convienence; user specific enhancements are likely not possible; and the code is not auditable. UEFI is much more complex than the BIOS that it replaced. It consists of millions of lines of code and is an entire operating system, with network device drivers, graphics, USB, TCP, https, etc, etc, etc. All of these features represents increased "surface area" for attacks, as well as unnecessary complexity in the boot process. coreboot is open source and focuses on just the code necessary to bring the system up from reset. This minimal code base has a much smaller surface area and is possible to audit. Additionally, self-help is possible if custom features are required or if a security vulnerability needs to be patched. What's wrong with UEFI Secure Boot? Can't audit it, signing keys are controlled by vendors, doesn't handle hand off in all cases, depends on possible leaked keys. Why use Linux instead of vboot2? 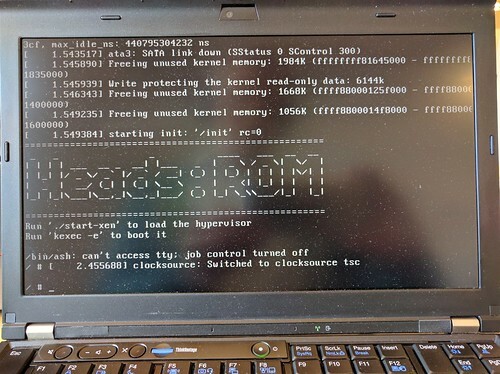 vboot2 is part of the coreboot tree and is used by Google in the Chromebook system to provide boot time security by verifying the hashes on the coreboot payload. This works well for the specialized Chrome OS on the Chromebook, but is not as flexible as a measured boot solution. By moving the verification into the boot scripts we're able to have a much flexible verification system and use more common tools like PGP to sign firmware stages. The mainline grub doesn't have support for TPM and signed kernels, but there is a Trusted grub fork that does. Due to philosophical differences the code might not be merged into the mainline. And due to problems with secure boot (which Trusted Grub builds on), many distributions have signed insecure kernels that bypass all of the protections secure boot promised. Additionally, grub is closer to UEFI in that it must have device drivers for all the different boot devices, as well as filesystems. This duplicates the code that exists in the Linux kernel and has its own attack surface. Using coreboot and Linux as a boot loader allows us to restrict the signature validation to keys that we control. We also have one code base for the device drivers in the Linux-as-a-boot-loader as well as Linux in the operating system. What is the concern with the Intel Management Engine? How about the other embedded devices in the system? Should we be concerned about the binary blobs? Maybe. x230 has very few (MRC) since it has native vga init. Why use ancient Thinkpads instead of modern Macbooks? The x230 Thinkpad has coreboot support, TPM, nice keyboards and are very cheap to experiment on. If you're willing to spend a bit more, the Chell Chromebooks (commericaly available as the HP Chromebook 13 G1) has Skylake. How likely are physical presence attacks vs remote software attacks? is it worth doing the hardware modifications? Depends on your threat model. Should I validate the TPMTOTP on every boot? Probably. I want to make it also do it at S3. S3 is subject to cold boot attacks, although they are harder to pull off on a Heads system since the boot devices are constrained. However, without tpmtotp in s3 it is hard to know if the system is in a safe state when the xscreensaver lock screen comes up. Is it a fake to deceive you and steal your login password? Maybe! It wouldn't get your disk password, which is perhaps an improvement. Disk key in TPM or user passphrase? Depends on your threat model. With the disk key in the TPM an attacker would need to have the entire machine (or a backdoor in the TPM) to get the key and their attempts to unlock it can be rate limited by the TPM hardware. However, this ties the disk to that one machine (without having to recover and type in the master key), which might be an unacceptable risk for some users. This page was last edited on 6 October 2016, at 03:12.